7 days left…there’s just a chance I might actually make it. On Saturday, my mother and I headed to Uptown to check out a yarn store, The Shabby Sheep. It’s in a quaint old yellow house with an old-fashioned porch and the store is absolutely stuffed with gorgeous yarn. My mother, as always, veered off in the direction of novelty yarns while I checked out their sock yarns. And they had some beautiful sock yarns. 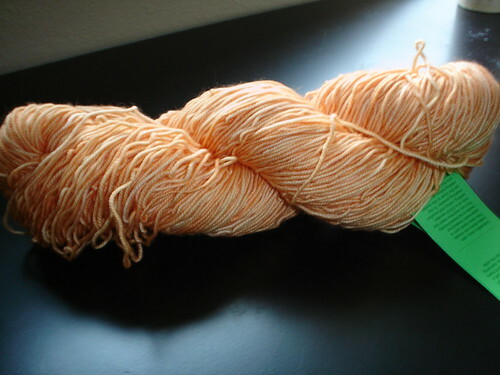 I found myself unable to resist a skein of Colinette Jitterbug in a shade called Apricot Smoothie. I love that soft shade of orange, and it’s one of the few colors that makes my sallow skin glow. This is destined to be a scarf. 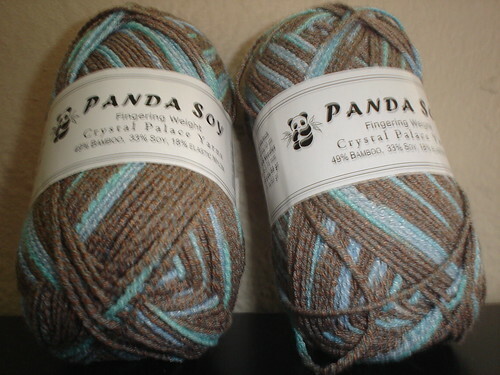 I also ended up with another sock yarn, Crystal Palace’s Panda Soy. It’s a bamboo/soy mix, and the end result is silky smooth and almost boucle-looking. I couldn’t find the second skein anywhere on the shelf, and the really lovely woman checking me out stopped midway, dumped everything on the shelf into a box, and sorted until she found the second skein for me. This is the same woman who was setting up a new monitor for the store, helping customers locate a pattern, and chatting with me about Ravelry. This store is a keeper. And I can finally stop teasing with glimpses of projects, because the secret project I alluded to in my last post has reached its new home. 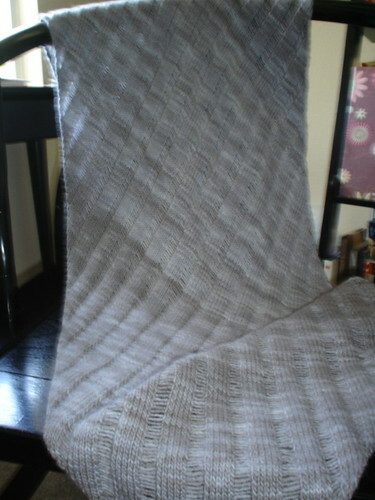 About a year ago, my friend Erin asked me if I would knit her a Clapotis in exchange for a custom piece. I’m a huge fan of Erin’s work, so I said yes. 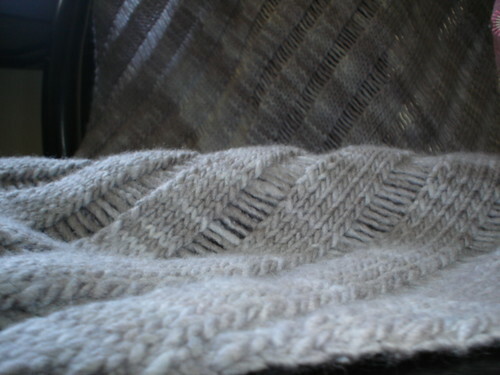 She settled on Malabrigo in a frost grey shade, and I got to work. Well, I got to work several months later, but that’s good for me. The pattern is boooooooring, and there were a few moments when I wondered if it would ever resemble anything other than a wooly rectangle. And then, one day, it did. And it’s gorgeous. 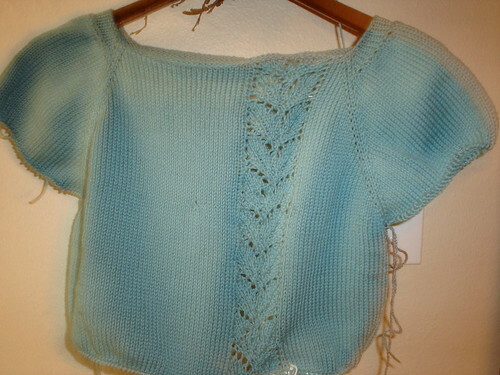 And I got to drop stitches…on purpose! Wow, you’re really making progress with that, aren’t you? Is it taking a lot of work? It’s definitely looking good. The Clapotis is beautiful! Erin must be delighted with it. And, unlike me, you might actually finish the Ravelympics!